When the capital of Spain was transferred from Toledo to Madrid in 1561, King Felipe II he wanted a cathedral for his new capital. 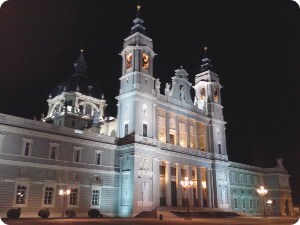 Plans were discussed as early as the 16th century to build a cathedral in Madrid dedicated to the Virgin of Almudena, but construction did not begin until 1879. The site on which Almudena Cathedral now stands was originally occupied by Madrid's first mosque, then by a church dedicated to one of Madrid's patron saints, Santa María de la Almudena. Francisco de Cubas designed and directed the construction in a Gothic revival style. Construction ceased completely during the Spanish Civil War, and the project was abandoned until 1950, when Fernando Chueca adapted the plans of de Cubas to a Baroque exterior. The Cathedral was not completed until 1993, when it was consecrated by Pope John Paul II. The Cathedral is 104 m long and 76 m wide. The central dome has a diameter of 20 m. The building is situated adjacent to the Royal Palace, in front of "Plaza de Armas" of the Palace, on the south side. The bright interior of Almudena Cathedral is based in the Neo-Gothic style, that it is uniquely modern, with chapels and statues of contemporary artists, in heterogeneous styles, from historical revivals to "pop-art" decor. The Neo-Romanesque Crypt, built in the 19th century, is the oldest section of the Cathedral and houses a 16th century image of the Almudena Virgin. Nearby along the Mayor Street excavations have unearthed remains of Moorish and medieval city walls. Note: The entrance to the Cathedral is free but not the entrance to the Museum. Monday to Saturday from 10:00 h to 14:30 h.
Closed on Sundays and days of special cult acts.